which the character impacts an indelible image on the viewer, the public and the industry take notice, singling out the best. previously, the victory was especially sweet due to the most formidable competition ever – fellow nominees Louis Anderson, Ernest Borgnine, Dom DeLuise, and Jeffrey Tambor. In addition to his Emmy, Rob won back-to-back Annie Awards in 1997 and 1998. “I absolutely love what I do and thank my lucky stars for twenty five years of full time employment in this business,” he admits. 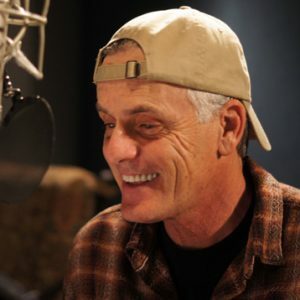 Interestingly, in those twenty five years, Rob now has the unique opportunity to have gone full circle with the Teenage Mutant Ninja Turtles animated series; having voiced Raphael in the original show, he is now voicing Donatello in Nickelodeon’s much anticipated TMNT. Originally from Detroit, Michigan, Rob “loved cartoons like most kids ” and aspired to be a professional hockey player. “Fortunately, I learned pretty quickly that I had neither the talent, temperament nor dental insurance to pursue a career as a pro hockey player”. Ironically, acting was something to “fall back on” and Rob has voiced beloved characters in several iconic animated series: Yakko Warner in Animaniacs and Carl Wheezer in Jimmy Neutron, Boy Genius, but may be best known to animation fans the world over as the voice of the boisterous and energetic laboratory mouse Pinky in two hit series Steven Spielberg Presents Pinky and The Brain and Pinky, Elmyra, and The Brain for Warner Brothers. 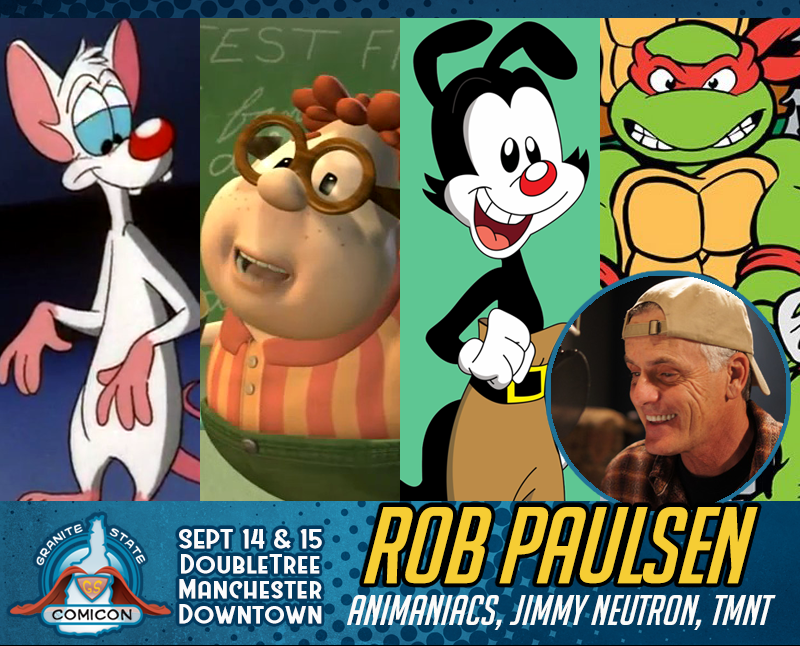 With over 2,000 half-hours of animation to his credit, Rob’s versatility shines in his starring roles as the voices of Yakko, Dr. Scratch‘N’Sniff and Pinky in the Peabody and the two-time Emmy award-winning series, Steven Spielberg Presents Animaniacs also for Warner Brothers. Currently, he can be heard as Peck in Back at the Barnyard, Birdbrain in T.U.F.F. Puppy, Jack Fenton in Danny Phantom and various characters, including Mark Chang in Fairly Odd Parents, all on Nickelodeon, as well as a number of Disney projects including The Little Mermaid III; Ariel’s Beginning, Jacques and the Grand Duke in Cinderella and the role of Bobble in the Tinkerbell DVD series. For young fans of Play House Disney, Rob provides the voices of Al in Can you teach my Alligator Manners? and Ze Fronk in Tasty Time with Ze Fronk and Toodles in Mickey Mouse Clubhouse. Paulsen’s extensive credits include on-camera roles in numerous motion pictures including Body Double, Stewardess School, Eyes of Fire, The Perfect Match, and Warlock. His television acting credits include guest starring roles on MacGyver and St. Elsewhere. Additionally, he is one of the most sought-after voice actors in the commercial arena, performing in over 1000 of them including the voice of Mr. Opportunity on behalf of Honda automobiles from 2004 thru 2010. Rob is also the host of a successful podcast, Talkin’ Toons, available at www.robpaulsenlive.com and iTunes. Realizing how fortunate he is and passionate about giving back, Rob supports various charitable organizations, particularly Operation Smile, The Wounded Warriors Project and cancer and Muscular Dystrophy research. A certified “gearhead”, Rob is also passionate about sports cars and motorcycles in addition to being an avid golfer. He also still laces up the ole skates every now and then to scratch that hockey itch. Rob spends the majority of his free time with his wife, Parrish, son Ash and two Yorkshire terriers, Pooshie and Tala.